Apple Senior Vice President of Worldwide Marketing Phil Schiller took the wraps off the much-anticipated iPad mini on Tuesday, with the new device featuring a 7.9-inch display, a slim and lightweight 7.2 mm body and a starting price point of $329 for a 16-gigabyte Wi-Fi-only model. 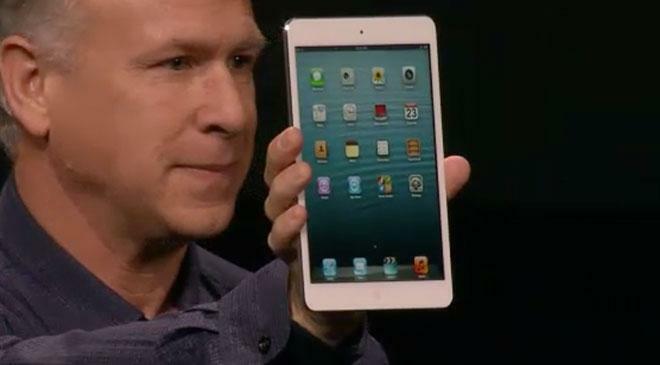 Apple's new iPad mini fits in the palm of your hand. 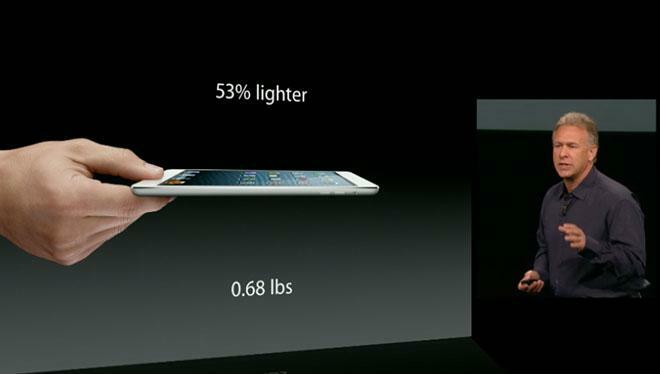 At 7.2-millimeters thin, Schiller said the iPad mini is as "thin as a pencil," and tips the scales at a slight 0.68 pounds. In comparison to the newly-announced fourth-generation iPad, the mini weighs 68 percent less, light enough to be carried easily in one hand. It seems that Apple intends this is the way most people will interact with the small form factor tablet, especially given the new automatic scrolling mode in iBooks that basically allows for hands-free reading. Schiller boasted that the device can be held with one hand, as it features a thinner bezel on the sides. As for colorways, the iPad mini takes its cues from the iPhone 5, and is available in black and white colors. 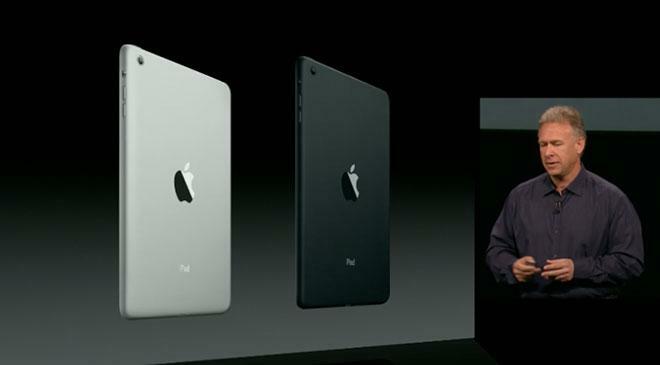 Like Apple newest handset, the 7.9-inch tablet features "black and slate" and "white and silver" options, the former featuring an anodized back shell, the first time an iPad's aluminum has been colored. Because the mini's display has the exact resolution of the iPad 2, it can access more than 275,000 applications written for the iPad platform. A number of side-by-side shots of the iPad 2 and the iPad mini running various iPad-centric apps illustrated there was no interpolation going on, and the smaller unit's display is noticeably sharper. The iPad mini's internals feature an A5 chip, FaceTime HD camera, 5-megapixel iSight camera, LTE connectivity, faster Wi-Fi, and the new Lightning connector. It also features what SVP of Industrial Design Jony Ive calls the single thinnest battery cell Apple has ever used, boasting 10 hours battery life to match the fourth-generation iPad. Dual-band (2.4GHz and 5GHz) 802.11n Wi-Fi is built in and supports channel bonding to reach download speeds of up to 150 Mbps. As for cellular data LTE is offered out of the box, along with GSM/UMTS protocols HSPA, HSPA+, and DC-HSDPA. Mobile hotspot functionality is also an option, though pricing and availability depend on carriers. Also high up on the list of features is Siri functionality, something that even the 9.7-inch iPad 2 still lacks. The mini can tap in to Apple's virtual assistant over Wi-Fi or cellular data and offers the same functionality as its iPhone and full-size iPad counterparts. 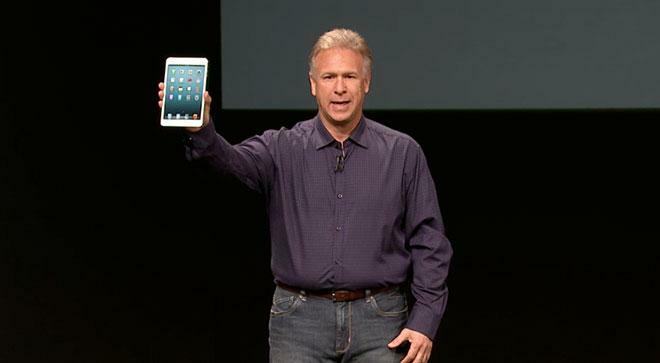 In a comparison with the Nexus 7, Schiller noted that the iPad mini is made of metal and comfortable to hold in one hand. The iPad mini also has a larger 7.9-inch display that gives 29.6 square inches of space, compared to just 21.9 square inches for the Nexus 7. 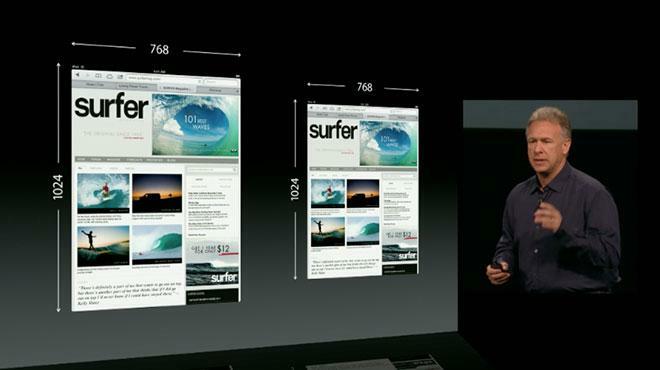 "The iPad mini is actually over a third larger display area," Schiller said. When Android controls are taken into account, the display area of a website is 49 percent larger on the iPad mini in portrait as well. 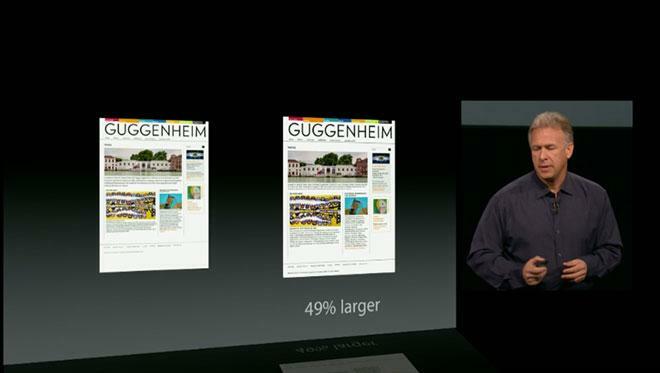 And in landscape orientation, the iPad mini offers 67 percent more screen real estate. 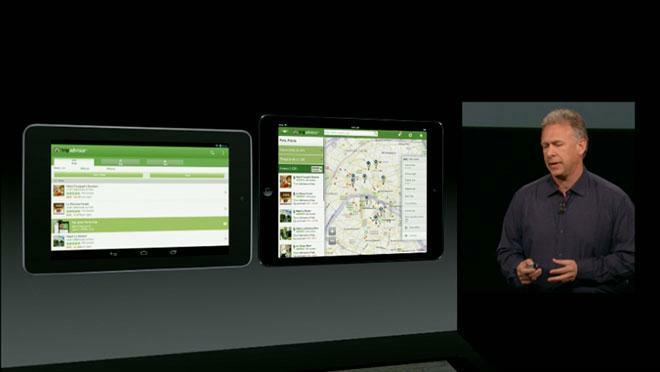 He also compared what the Yelp application looks like on the iPad mini, designed specifically for tablets. In contrast, the Android-based Nexus 7 features an application written for smaller smartphone screens. It also has its own entirely new Smart Cover that does not have a separate aluminum hinge like those made for the full-sized iPads, and is made of just one material. iPad mini with Wi-Fi models will be available in black & slate or white & silver on Friday, Nov. 2, for a suggested retail price of $329 (US) for the 16GB model, $429 (US) for the 32GB model and $529 (US) for the 64GB model. iPad mini with Wi-Fi + Cellular will start shipping a couple of weeks after the Wi-Fi models, beginning in the US with partner carrers AT&T, Sprint and Verizon. Pricing for the Cellular models will start at $459 (US) for the 16GB model, $559 (US) for the 32GB model and $659 (US) for the 64GB model. 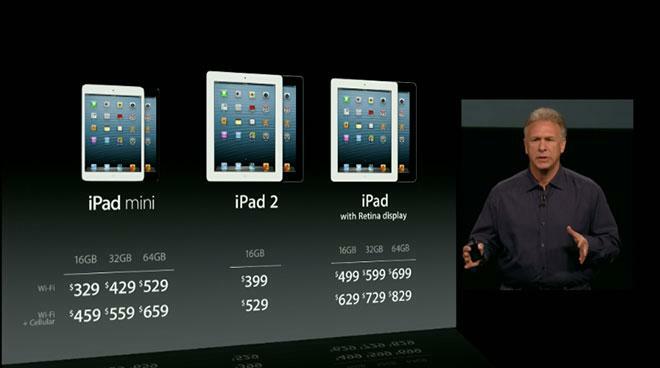 Customers can begin pre-ordering all models of iPad mini on Friday, Oct. 26 through the Apple Online Store in the US, Australia, Austria, Belgium, Canada, Czech Republic, Denmark, Finland, France, Germany, Hong Kong, Ireland, Italy, Japan, Korea, Luxembourg, Netherlands, New Zealand, Norway, Poland, Portugal, Singapore, Spain, Sweden, Switzerland and the UK. 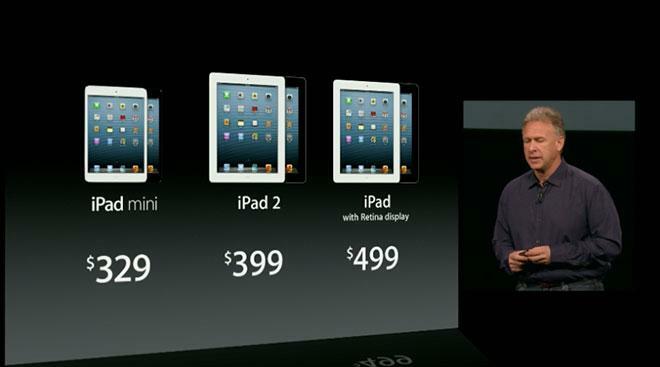 Preorders for the iPad mini, along with the new fourth-generation iPad, will begin this Friday. The Wi-Fi-only model will launch a week later, with the cellular-capable model to follow.